I love accessories - hats, gloves, scarves, headbands, jewelry - you name it and I probably own it. I'm afraid the apple won't fall far from the tree because as I look to make things for our baby, I keep gravitating to accessories - especially hats. Modifications: None - it's perfect! I love this hat! 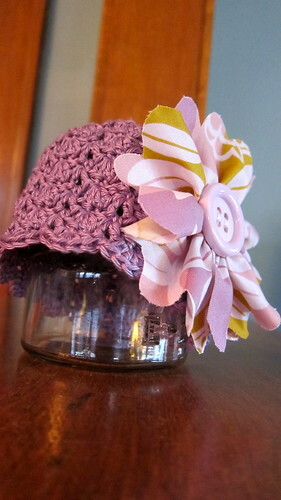 The pretty scalloped edge, the big flower, the open crochet pattern - it's just so cute! And I have plenty of yarn left over to make the Toddler size. 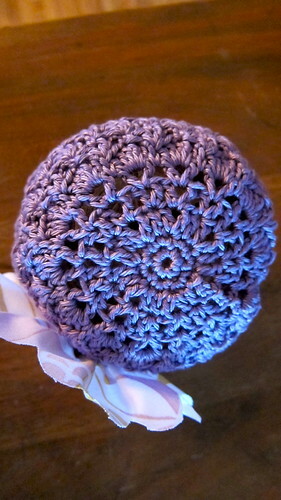 It only took a few evenings in front of the tv - less than 3 hours total to make the entire hat (flower included). Now off to finish that newborn sized shrug . 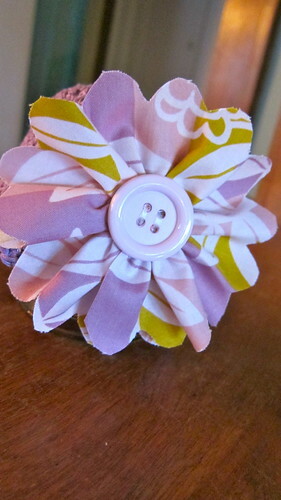 . .
You'll be able to move the flower right on up to the toddler size! Very cute! Darling! How do you find all these cute patterns?